The Workers Solidarity Movement has decided to withdraw from the Campaign Against Home and Water Taxes. Please see statement below. We have made a donation of €1,000 towards paying off the debts of CAHWT. 1. It is now clear that the boycott of the property tax has collapsed and with it, any chance of defeating it in the coming period. The tactic of boycott was enough to defeat the household tax, but with draconian powers handed over to revenue to collect the property tax, much more was required. 2. The tactics pursued by the Campaign against Home and Water Taxes (CAHWT), to build a boycott, mobilise to protest on the streets and to argue for a campaign of industrial action by workers implementing the tax, was the only approach that had any chance of success. But for that to happen, mass participation was necessary. 3. The principal reason that the campaign was not successful was that not enough people got involved. If protests were to have an impact, tens of thousands were needed on the streets. Occupations of government buildings needed to be more than the tokenistic acts of a few dedicated activists with the ability to cause a real and sustained disruption to the business of the state. 4. Participation at local level never took on a mass character. In some areas campaigns were organised on a local basis. In most cases, however, only regional campaigns existed with activists working hard for the campaign, but burning themselves out due to the high level of activity required to cover large areas. Even where campaigns existed in a locality, the numbers were not sufficient to sustain a struggle of that duration. 5. We live in an era where clientelism dominates the political landscape. For many reasons - pressure of long commutes, no real extant sense of community/trade union solidarity, no tradition of self-organisation etc etc - most people's sense of getting involved in politics amounts to supporting 'someone else' to do it. Not enough people felt that they needed to get involved to make a difference. Instead they held off on registering but when the hoped-for response from 'someone else' didn't emerge they were easily intimidated into paying by government propaganda. 7. Even after it became clear that at least half of the CAHWT campaigns were vehemently opposed to this tactic, the Socialist Party insisted on continuing to pursue it. The effect was to cause a major rift in the campaign at a crucial time in the battle. Some local campaigns, mainly ones dominated by the Socialist Party, are continuing to pursue this tactic. 8. Other political parties involved in the Campaign e.g. the SWP/People before Profit Alliance did not support the SP’s push to turn the CAHWT into an electoral platform but made it clear that nearer the election their candidates would be seeking ‘endorsement’ from the Campaign – which in effect amounts to another, if softer, version of acquiescing to the clientelist approach to politics. 9. All of this raises questions over the viability of CAHWT as a united national campaign in the future, particularly in the battle against the water charge. It is impossible to imagine a situation where a few candidates and politicians will be accepted by the majority of activists as spokespeople and representatives for the campaign. It will also be impossible for local campaign groups who are not pursuing an electoral path to disassociate themselves from the politicians and candidates who will be presumed by the media and others to be speaking on behalf of the entire campaign when in fact no democratic controls of candidates are possible. We feel, therefore, it is crucial for those activists and local groups who are serious about building a campaign based on direct action, participatory democracy and autonomy from political institutions to regroup for the next fight. 10. 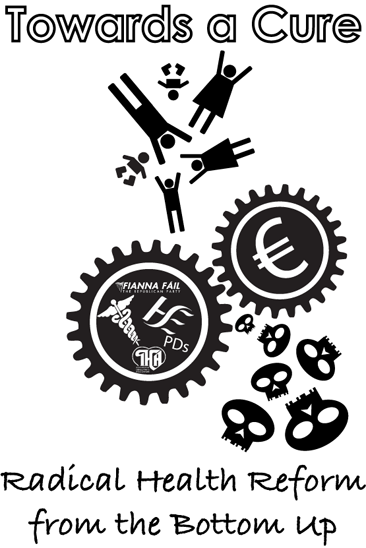 The water charge will only be defeated if a campaign of mass participation can be built. More people will need to be involved than even at the high points of the campaign against the household tax. People will need to be prepared to, not only boycott the charge, but obstruct the installation of water meters and to sabotage ones that have already been installed. 11. For the reasons outlined above, we no longer feel that CAHWT, is the appropriate vehicle for this purpose. The divisions between those who advocate a representative approach and those who advocate direct action have grown too wide. We hope to work with many of the activists that were part of CAHWT in this campaign and to help mobilise our communities in resistance. 12. We are not suggesting that there are any easy answers. The failure of the CAHWT to mobilise large numbers on protests against the property tax, plus the success of the majority of the public sector trade union leadership in frightening members into voting for the slightly modified version of Croke Park 2, suggests that the task of prompting, encouraging and motivating mass participation in actions designed to prevent the installation of water meters and defeat the imposition of the water tax will not be easy. The task of moving a significant section of the working class from the clientelist approach of wanting ‘someone else’ to do politics for them to a participatory approach where they see a role for themselves in bringing about change is what faces us. Having read the statement, still can't work out why the WSM is withdrawing from the campaign. The argument about SWP/PBP v SP is bogus at best, and facetious at worse. Do the WSM really think that the Irish were going to be radicalised overnight? Or do they think that the Irish Independent are going be concerned? Average Irish household net worth is about 100K. Most of that wealth is in property. So any wealth tax must tax property. Poor people like me do not own property and are not liable. I could not understand left wing parties opposing a tax on the most common form of wealth. Up to now you could own a multimillion mansion and pay no tax. You could even get the dole because your family home isn't counted when measuring your assets. When you sell your house, you don't have to pay any capital gains tax on the profits you make from the price going up. Why is this? Nobody knows. Of course the tax could be fairer, but it was wrong to just oppose property tax, appealing to a populist right wing frontiersman view of inviolable individual property rights. If you are a council tenant you will be paying property tax. There was an article in the Irish Times this week detailing how the wording of the property tax legislation was changed in order to facilitate the councils passing this so called "wealth tax" onto their tenants. If you google "council tenants to pay property tax" to find the article. The property tax is not a tax on wealth. It is a tax on the home. The people who are hit by this tax are working and unemployed people, pensioners etc not property speculators. Landlords who own several homes will have to pay, but they will have to pay similar rates to people who, do not actually own their homes outright, but are simply holders of huge mortgages. Landlords will pass on the cost of this in rents, as will local authorities who administer social housing. WSM is still opposed to the so called "Property Tax", we have simply left the CAHWT for the reasons outlined in the statement. If you want a parralel, think the bedroom tax in the UK or the previous poll tax. Those in favour should take a look at the US and the millions of people forced to live in camper vans because they cannot pay the taxes on the homes they have spent most of their lives working for. Once you are on a pension the tax is too high and it does not come down because you have finished work. Will this be the future of the elderly in Ireland. There was a time and Irishman could finally own his own home. Not any more. "not a tax on wealth, a tax on the home"
I don't own a house (or a "home"). So I don't pay. If I won 500K on the lotto tomorrow and put it in the bank I would be rich. But if I used it to buy a gaff, would that not be wealth any more? Landlords who own multiple houses will pay a multiple of those who own one. That sounds fair. People with mortgages on low wages can defer tax payment to the date when their house is sold. People take out mortgages partly out of speculative greed. With no capital gains tax to pay and empirical evidence from their parents that property makes you rich, they hope to make a tidy sum by cashing in future gains on a leveraged asset. I don't think this should get anyone a tax exemption. The idea that landlords will simply "pass on" the tax to tenants is only partially true. Tax incidence theory tells us that taxes are shared between supplier and consumer in proportion to the relative elasticities on both sides. Yes, rents will rise as a result of property tax but not by an amount as much as the tax. Net landlord income will fall because the rent rises won't cover the whole cost of the tax. Additionally, the capital value of houses will fall because this newly taxed asset will become less attractive to investors. So that's another hit for landlords. UK poll tax (the thatcher version) was different. It was a fixed charge per person, regardless of income or property value. Irish property tax is based on house price. The current council tax is closer to the Irish version. Bedroom tax is an reduction of welfare payments for people who have spare rooms in their houses. People on pensions under 15K (or 25K for a couple) get to defer payment until after they die, so nobody's getting their house taken off them for being poor. There is approx €200bn worth of Irish residential property. It's high time it was taxed. I agree with that timely decision and with the reasons exposed. It would be positive further public debate around the key points of taxation and property. It's not your fault some popular misconceptions about them. I agree with your thoughts about mass partipation in a clientelist system, and the need to enhance direct action as a mean for propaganda. We'll not lack the grounds to participate in new campaigns. i found it always very uncomfortable and incongruent that an anarchist movement was supporting an anti property tax campaign that in my opinion was ingrained and nurtured by the idea of defending the concept of private property. i always sustained that an anarchist movement should fight for the idea that housing is a foundamental universal right. if i have no shelter for my self or family i feel i have the right to take it. same for the water. it's a foundamental universal right: if i need it i take it. i hope that the WSM could focus on squatters rights with the perspective that it is a political tool to achieve the foundamental universal right of having a shelter. Not only on squatters rights - on security of tenure and fixed and fair rents for tenants, for social housing for people who want it, for occupation of empty habitable Nama housing, for cooperative housing, against evictions, against homelessness, for strong tenants organisations, decent employment and wages so that people can afford to contribute to services, and plenty more. Anti-tax and pro property campaigns - why ? Yeah, like focusing on squatters' rights is really going to be useful to working class families trying to keep their heads above the water! re - squatters' rights - this is something that's very much become a wider concern in economic situations close that of the Irish one, for example in Spain, where the anti-eviction and mortgage holders movements have been re-occupying houses where people have been evicted, or simply occupying unused properties in order to house people left homeless through the crisis. These movements, from what I understand, are quite diverse in their makeup, with many activists coming from a background in the autonomous social centres and squatting movement; the former having developed in Spain partially as a more outward looking politics critical of (but emerging from) the marginal/subcultural character of much of the squatting 'scene'. So, yes, I'd say squatters' rights absolutely have a place (not exclusively) in an approach to housing struggles.